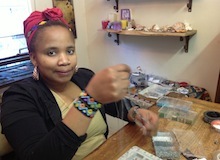 Located in Hout Bay, Main Road on route to Chapman’s Peak and 20 minutes from Cape Town, Rockchic is a semi-precious gemstone jewellery and bead shop. 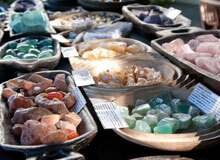 Like most rock/gem shops, you can find an assortment of semi-precious stones for presentation and personal uses, as well as aromatherapy burner oils, palo santo, smudge sticks, incense, california sage, gemstone beads and information on the healing properties of crystals. 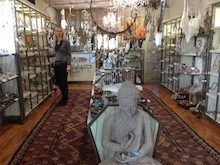 However, what makes Rockchic Gem and Bead Shop stand out are its unusual necklaces, bracelets and other handmade jewellery. Items tend to be big and bold, chunky and funky. I can guarantee that no one else will be wearing a piece like it at your next dinner party. Express your individuality with Rockchic’s beautifully handcrafted gemstone jewellery. Our unique range includes chunky pieces of Turquoise, Coral, African Jade, Carnelian, Peridot, Agate, Quartz Crystal, Fluorite, Fossils, Rose Quartz, Amethyst and Vintage elements. Each beautiful piece of jewellery Rockchic creates has its own subtle energies. The beauty of crystals makes them a natural choice in personal adornment and their uniqueness imbues them with magical power: the power to protect, to enhance, to strengthen, and to uplift. Rockchic Crystal Shop stocks a full range of semi precious stones for healing purposes, ranging from quartz crystal, kyanite, fuchsite, black tourmaline, smoky quartz, rose quartz, amethyst, citrine, celestite and agates. We stock a full range of aromatherapy oils and burners, candles, Japanese, Indian, Australian and Balinese incense, Sage and Impepho sticks as well as a gemstone and bead scratchpatch outside for the kiddies and and upmarket sports pub next door for any bored husbands. 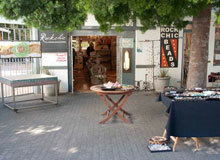 RockChic is Hout Bay’s only gem and mineral shop and is quite unique with lots of community based events. Children, teenager and adults make their own jewelry in the bead shop and we have a professional staff member ready to advise, assist and repair your broken gemstone jewelry. We charge a fee for repairs and individual tuition.